Let’s be honest: the notion that you can import prescription drugs from one country at a cheaper price and pass those savings on to consumers in another country is fraught with complications. And not the complications that some politicians have been touting - counterfeit drugs that don’t meet safety requirements, which opponents of country-to-country drug importation cite as the major concern. And when I say ‘opponents’, I really mean powerful lobbying groups. Let’s take the example of the US. Earlier this year a group of US senators tabled a bill proposing such a mechanism from Canada, effectively giving wholesalers, pharmacies and individuals the right to import drugs from Canada. And then after two years of doing this from Canada, the Secretary of Health and Human Services would have the authority to permit importation from countries in the Organisation for Economic Co-operation and Development (OECD) that meet specified statutory or regulatory standards that are comparable to US standards. The bill has all kinds of rules, conditions and rigid requirements. But assuming that a certified foreign seller could meet all the hurdles and qualify as an exporter, there are at least two troubling questions among the many that keep me awake at night. 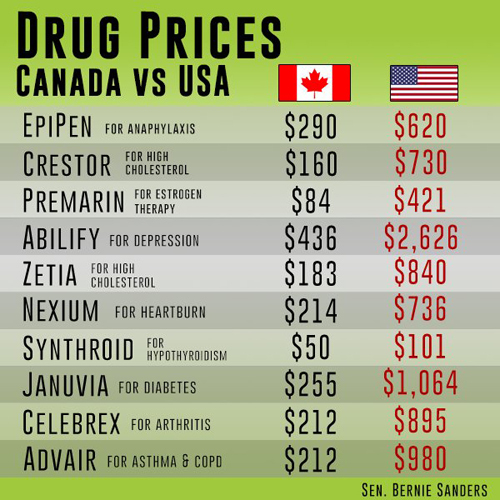 Who governs the resale of these cheaper medicines from Canada to the ultimate US patient to ensure that savings are actually being passed on in a meaningful way? And, perhaps, more importantly, what happens when Canadian patients cannot get access to their medications because their pharmacy has used up their allotted supply for US customers through direct shipments or when the Canadian pharmacy doesn’t receive its usual supply of a therapy because the Canadian wholesaler has sent its allotted supply to the US? On the first question, there is no visible strategy or clear-cut legal requirement for importers and eventual resellers to stay within an upper threshold of price increase that I can discern. If a US patient buys directly from a Canadian foreign seller (ie a certified pharmacy or wholesaler), then the point is moot as the savings go directly into the patient’s pocket. But what happens when US wholesalers and licensed pharmacies start buying up Celebrex for less than $200 and then reselling it for a nominal discount - say $795 instead of $895? Who steps in and says that they can’t do that? Or that they can. Who governs the required amount of savings that must accrue to the patient or, in the case of profit, to the US importer? And what of the millions of Canadian patients who might be impacted by this legislation? A recent update to a 2010 paper postulates that if just 20% of US prescriptions flow through Canada, the Canadian branded prescription drug supply would be exhausted in approximately eight months. And if 40% of US prescriptions flow through Canada, the branded prescription drug supply would dry up in less than six months. At what point does the Canadian government (or the government of any OECD nation in two years’ time) step in and prevent Canadian pharmacies and wholesalers from selling to the US? Or allowing them to sell but limiting how much they can sell. And, again, how do they enforce it? Solutions ranging from the imaginative to the absurd have been proposed. So far, none have been required as the legislation has not yet been passed. But believe it when you hear that the sheer demand of prescription drug volume from the US has the ability to send shockwaves through a neighbouring country’s supply chain. I think we’re all for lowering drug prices. And I know we’re all for helping patients access affordable medicine. But, at the risk of sounding grossly nationalistic, these large policy issues require nations to redouble efforts and look inward for solutions. The idea that one can turn to a neighbour for a solution is, at best, a short-term solution reserved for the most extreme cases like a drug shortage. Putting pressure on other countries’ supply of therapies - in perpetuity - for their own citizens is not the answer. At least, not in my backyard.